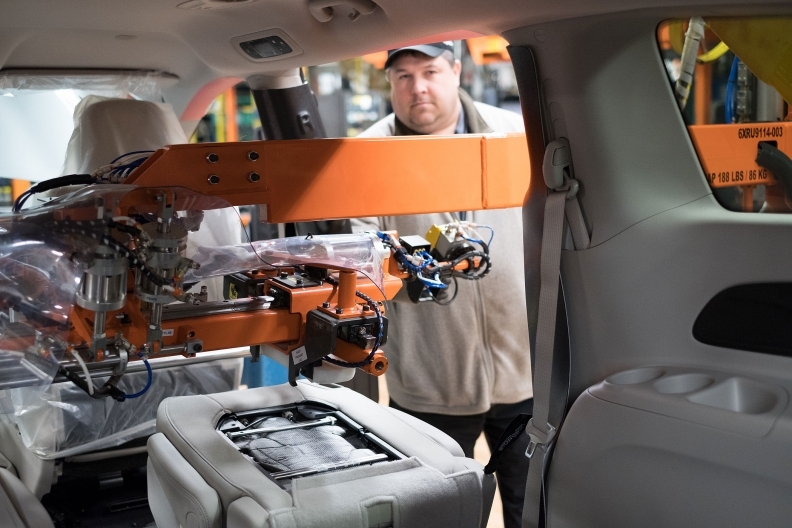 A worker installs seats in the new Chrysler Pacifica minivan at Fiat Chrysler's assembly plant in Windsor, Ont. Canada’s manufacturing sector shed about 7,500 jobs during the month of October, Statistics Canada reported Nov. 4. About 1,690,500 worked in the sector, which includes auto assembly and parts manufacturing. That's down from 1,698,000 in September. It also represents a decline of 5.6 per cent from October 2015, when 1,944,500 people worked in Canadian manufacturing. The numbers come about a week after the Original Equipment Suppliers Association, a leading industry trade group, said suppliers believe an economic downturn is on the way. The OESA Barometer Index checks in quarterly with 430 companies and the October survey put the North American supply base at a scored of 48 out of 100. “A score below 50 suggests suppliers have a negative view on their company’s business outlook,” Charles Chesbrough, OESA chief economist, told Automotive News in October. In Windsor, Ont., a hub for auto parts manufacturing and home to FCA’s Windsor assembly plant and three Ford engine plants, the unemployment rate was 5.3 per cent. Nationally, the unemployment rate was seven per cent for October, with the economy adding 44,000 jobs.